According to an Ipsos poll, when shopping for clothes, 76 per cent of Canadians feel stress that they're paying too much for something while just 59 per cent are concerned about child labour. With the sun shining brighter every day, I plunged into my sons' closets last weekend, in search of spring clothes that would still fit them. Sitting there, sipping, I thought of another little boy, one whom I hadn't seen in a while. His name is Jewel. According to an Ipsos poll, when shopping for clothes, 76 per cent of Canadians feel stress that they're paying too much for something while just 59 per cent are concerned about child labour. Debbie Wolfe explores what this means for children like Jewel. With the sun shining brighter every day, I plunged into my sons' closets last weekend, in search of spring clothes that would still fit them. We all had a good chuckle. My adolescent's ankles stuck out of his pants like twigs. My younger son's t-shirts looked like crop tops. It was clearly time to go clothes shopping. My budget was extremely limited, having just paid for all of the boys' summer camps and activities. I was on the prowl for the cheapest stuff I could find. Walking through the stores, I was disappointed to learn that most of the spring sales hadn't started yet. How was I supposed to outfit my kids for spring when kids' t-shirts were still more than $10 a piece? "What an outrageous price," I muttered grumpily. I decided to regroup in the food court with a coffee. Sitting there, sipping, I thought of another little boy, one whom I hadn't seen in a while. His name is Jewel. I met Jewel last April, on a World Vision trip to Bangladesh. His parents were two of the country's 3.6 million garment workers, making clothes for stores in places like Canada. They had moved to the capital, Dhaka, for jobs in one of the city's many garment factories. Jewel and his siblings still lived in their village with their grandmother. 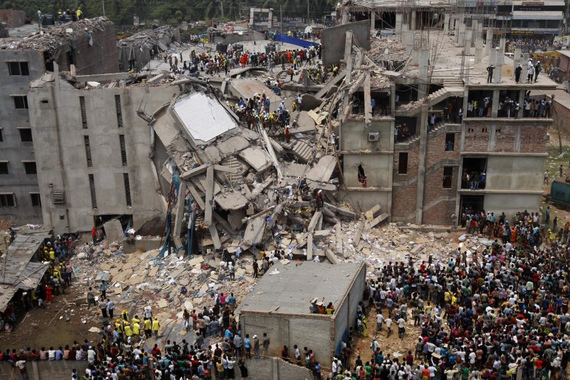 I remembered what Jewel had told me about the Rana Plaza garment factory collapse, two years ago today. It was a national tragedy. The whole country had been glued to television sets for the many days of recovery, watching in horror as hundreds of bodies were pulled from the mangled wreckage. Jewel had sat vigil by the village television set, as my boys often sit glued to our own TV. But while my sons are captivated by a hockey match or video game, Jewel was looking for his parents. For days, he scanned the wreckage and squinted at the dead faces, looking for his mom and dad. Jewel in his village, about 15 hours' drive from the Dhaka garment factories where his parents work. Sitting in the mall, my eyes filled with tears. In grumping about the prices, how could I have forgotten about Jewel? 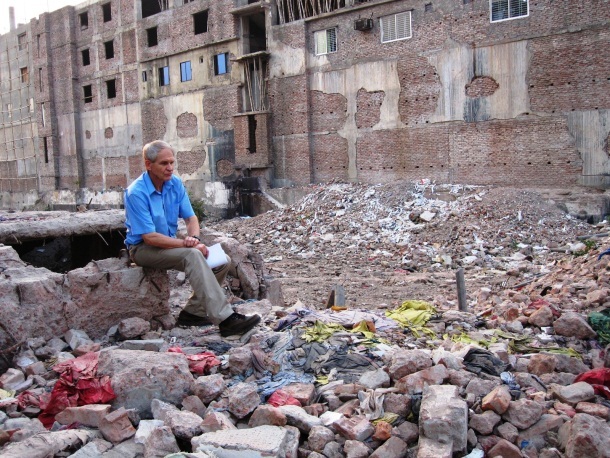 It was something I swore I'd never do a year ago, as I stood in the rubble of the Rana Plaza site a few days after leaving Jewel's village. I wondered how many children had lost parents in the disaster, because the factory wasn't kept in better repair. What role had I played in putting them in danger, because of my need for low, low prices here in Canada? If the workers hadn't been kept so desperately needy, how many might have chosen to stay home from work that fateful day? Huge cracks in the foundation had been discovered days before, and they were spreading. I took this photo of World Vision Canada's president as we visited the site of Rana Plaza one year after the collapse. Here, at least 1,100 people died two years ago today. Eventually, Jewel learned that both his parents were okay. But despite their hard work and sacrifice, there still wasn't enough money in the family to pay for the whole family's food, shelter, clothing and medical care. Like millions of children in Bangladesh, Jewel also had to labour. He works in a tea stall, about eight hours each day, brewing and pouring scalding liquid. Burns are frequent. I wish I could say that Jewel's story is unusual. But travelling around Bangladesh, I met hundreds of children in similar situations. 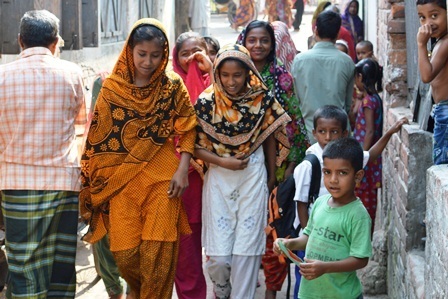 Some had left school altogether, like the girls I met in the city of Khulna. Because Khulna is host to the country's second largest sea port, boatloads of freshly caught shrimp and fish arrive daily. Children with quick hands and hungry bellies are the ones to cut off the heads, or slice out the black vein which many North American consumers find distasteful. The girls show us the route they take to work in the morning. We were not allowed inside the fish processing plant with them. "We often cut our hands with the sharp knives," said one of the girls, when I asked about injuries. I inquired as to what happens when they bleed, wondering if children are given a break or at least a bandage. "They just wash the blood off down the line," she said. 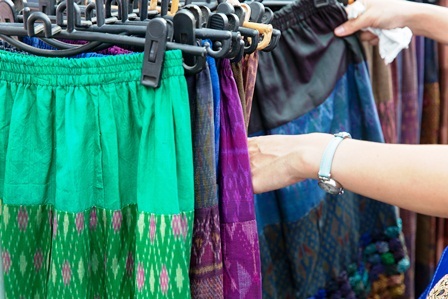 Since the Rana Plaza collapse, governments, businesses and individuals have begun exploring ways of unravelling the complex global supply chains which connect these children to our own. But it's going to take some time. Meanwhile, 76 per cent of Canadians feel stress when we're paying too much for something. Perhaps some of that stress would dissipate, if we had a clear sense that another dollar on a t-shirt price would help keep a factory from collapsing. 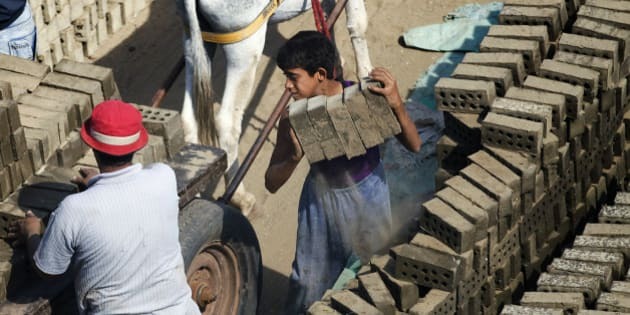 One thing that's absolutely clear to me is that sponsoring a child helps protect them from child labour exploitation. When World Vision works with a community, training parents with new skills, helping them start and run small businesses, teaching them how to form and grow savings and loans groups, or improving agricultural yields, children are better provided for. They can go to school, prepare for different futures. And they can play. That's something worth thinking about, as I see my kids running onto the soccer field in the sunshine this weekend -- too --small shoes and all.